I know a bloke who works for a bank. Let’s call him David. 2. The people who see the form don’t care what goes on his business card. So, in the box labelled ‘Position’, he carefully wrote “Dilettante”. Sure enough, when his business cards arrived, David found that the bank was paying him to be a dilettante. I’ve just run out of business cards, so I’m thinking about what I should put on the form. It seems to me that my business card and my e-address book (where I keep everybody else’s business cards) are a bit behind the times. For some people, I might want to add a Facebook page or a Google Plus profile. Unfortunately, there are no smart little boxes for those things in my e-addressbook. I could create custom fields, but they won’t connect to the right programs directly from my e-addressbook. Also, I know from experience that they won’t export to any other e-addressbook software either. Rather, my e-addressbook is stuck in the 1980s. It thinks that I want to send people facsimiles and page them. When did I last do that? Here is a quick test: Compare your business card to your e-mail signature. Is it different? In my case, almost none of the information in my sig is on my business card. On my business card, I want to be able to display the things that I would like to see about other people. I want to be able to list my Twitter handle, my IM and Skype names, and my LinkedIn profile. I network on Twitter, and it is a brilliant way to keep a conversation going after you have met someone. For academics who use Twitter, the following pattern seems fairly common: meet; exchange business cards; chat for a while; ask for Twitter handle; write Twitter handle on back of business card. How broken is that? Most days, I have my instant messenger client running in the background so that colleagues who use IM can quickly ping me when they have a question. It is easier than a phone call for quick, simple questions and you have a written record of the answer, just like e-mail. I use Skype to talk to colleagues overseas. While I don’t have it running in the background all the time, I want them to be able to find my Skype name quickly, without having to e-mail or IM me. LinkedIn is great for keeping long-term connections going, particularly with people who have left your organisation. If they update their LinkedIn profile, you can find out where they are now. This is invaluable when I am chatting to someone about their research and say, “You should contact…”. LinkedIn is the best way of quickly finding out where they have gone, and what they are doing now. I don’t want to list my Facebook page because I don’t use it professionally. But I know people who do, and who would love to put it there. Given that I want to record these details about other people, it seems to make sense that I put them on my business card and give them out the people I am meeting. However, my university seems blind to services outside of the ‘walls’. So, I’m not hopeful that I’ll get external services like Skype, LinkedIn and Twitter on my card. But who knows? Maybe the people who care about the card won’t see the form. 13 Responses to Do you have a card? I have a very minimalistic business card – I actually call it a “contact card”, since it only has my name, my username, my phone, e-mail, and blog url. I don’t need much more than that. I’m only a student, so I don’t really want a University-branded card when I can make my own just fine. Lovely business card. Mostly, I like that you have your avatar on your card. It looks great! I do like the idea clearly of sign-posting what the information is, so “fax” and “phone” rather than “f” and “p”, for example. On your card, though, I reckon that http:// serves that purpose. Given that there is only one Web address on it, and it is a contact card, I think people will fairly assume that the Web address leads to more information about you. Which it does. I like Barry’s idea of a “contact card” rather than a business card. How many people do we give our business cards to that aren’t – strictly – for business? Actually, my own card looks a lot more like at 19th Century “visiting card”, rather than something as suspiciously grubby and tradesmens entrance-y as a business card. Of course, it has none of the flashy connections you speak of, Jonathan! (not even a web address 😦 ) Also, because it’s one I had printed myself, there’s no e-version. Check this, I actually have to meet someone in person to hand them one. Radical. I would love to have a visiting card. Something that just had my name picked out in supercilious script, perhaps. I think that you are right. For the user of the business card the main reason is that you can give it to the person and they will have your contact details for contacting you later without having to find a pen and a scrap of paper, with the time and errors that involves. The reason for positions and things is to tell them what you do, again so that they can remember, if they want to contact you. This is to remind them why they might want to contact you. From the business’ view, another reason is brand advertising and corporate image. So they want it to bear that imaging. I guess I have a problem when the ‘branding’ extends to only having company e-mail addresses, etc. Do you have a personal card as well? I wonder how many people do? I went to my first conference recently and discussed with other PhD students about whether or not it was ok or pretentious at our grade/level to have business cards. I couldn’t quite bring myself to do it, but compromised by just pre-printing out some copies of my email address as it’s a bit of a long one and a hassle for people to scribble down in passing. What do other people think about the idea of PhD students having business/contact cards? I’ve always thought that PhDs float between being staff and being students. This is one area where I definitely think that you should think of yourself as ‘staff’. Your PhD is about building knowledge and building a career. It turns out that a good network can help with both. 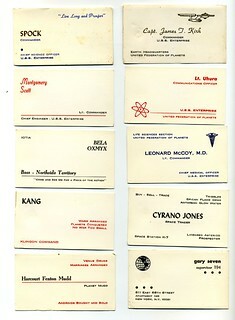 A business card is a great way to build a network. This is definately a must do for PhD students. I am only a Masters level student and also a casual staff member at my institution, but I will be armed with cards at this years conference I am attending. Too many awkward moments at last years conference where people asked for my card and I didn’t have one have convinced me it is worthwhile. I am hoping to make some connections at this conference so this will be a must for me. Good luck, Sarah, and have a great time!